Show the past, chart collated data, sketch what lies ahead. Skilful use of record-keeping, timelines, graphs, murals, videos, etc. 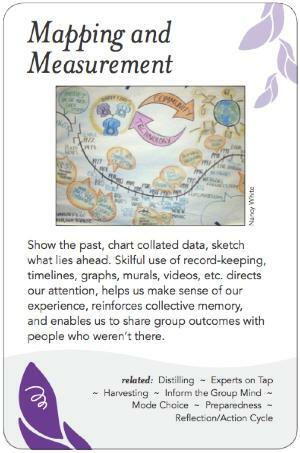 directs our attention, helps us make sense of our experience, reinforces collective memory, and enables us to share group outcomes with people who weren't there. This is the laying out of what is to be done, and the record of what has transpired, what has been agreed, and what has been achieved. A "map" is any type of visual representation of any of these four things (e.g. a Gantt or Critical Path chart). Agendas and schedules can be considered a form of 'map'. Graphic recording is another form of visual representation of any of these things (usually the latter three). Measurement is the means and criteria by which what has been achieved is gauged (or is to be gauged). In addressing the complex issues that group process usually focuses on, it is rarely possible to know in advance how to measure achievement (and often it is not possible at all, even when the event is finished). Sometimes it's just a sense from the group that it's been productive and has achieved its purpose. Sometimes the Purpose and Intention of the event will change as the group learns more about the situation; in such cases the map may have to be altered or discarded. There is a temptation for groups to develop "who will do what by when" next-step charts near the completion of an event. These often include measurements of the accomplishment of these next steps. This approach however disregards the wisdom of many in group process that the next steps should be left to the wisdom (passion bounded by responsibility) of the individual attendees at the session, rather than assigned. Nancy White's work on graphic recording.